Hi Doodlebug Fans! 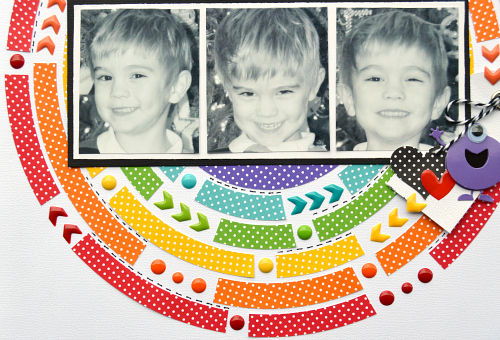 Christine joining you today with a colorful layout about my bright and cheerful littlest boy! The Swiss Dots Petite Prints are double sided and available in so many fabulous colors! 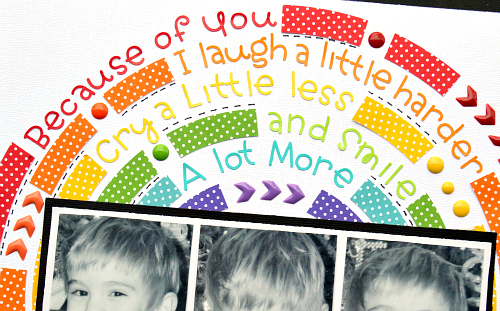 And of course they coordinate with all the fabulous Doodlebug embellishments. You simply can't go wrong with any color you choose! I decided to go for a rainbow effect. I cut out my circles and then layered them one onto another. I then started trimming out pieces and adding in my quote. I love adding meaningful, unique,and timely quotes to my layouts - I think it makes them a little more personal. Teensy Type Letters coordinated perfectly in all my color choices and made for a whimsical title! It took a little patience to put it together but I knew the time was going to be worth it! Using multiple colors ensured I wasn't going to run out of any of the letters I needed! 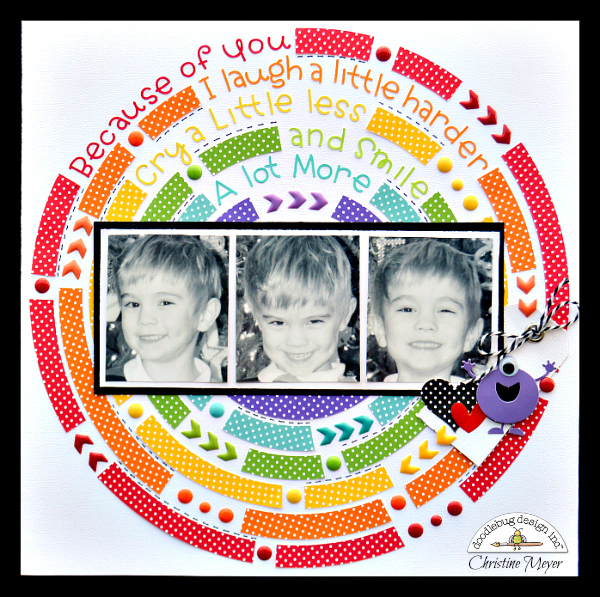 I can't get enough of all the different Sprinkles available from Doodlebug. I used both arrow ones and circle ones throughout to break up my circles and add some movement to the layout. 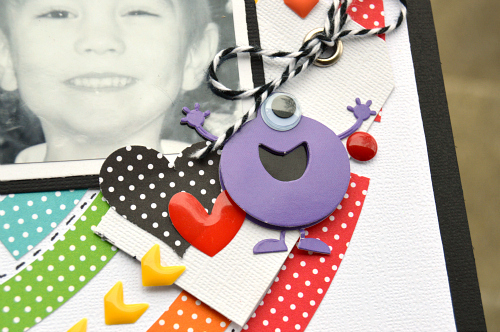 My final touch was adding a small tag topped off with a cute little monster Doodlepop. I debated on which Doodlepop to use there, but a toddler and cute monster seemed like the perfect combo! Because as well know toddlers are cute little monsters too! This LO is so adorable! Colorful and fun!! I love this page and so love the title!! Gorgeous LO! I love all the vibrant colors and the fancy details. What a wonderful title too! WOW What A Funtabulous Layout!! Your picture are adorable what cutie and has a smile that melts your heart. Love everything you chose to use and your sure put together one super outstanding layout...You so showcased your pictures perfectly. I love it. YOU so ROCK!! Thanks for your kind words Joan!